SAGINAW GEARS dot com: Hockey?... in Saginaw?... oooooookay. For people who were already hockey savvy, that first season of Gears hockey was a real grinder. As with any new franchise, the wins were few and the mistakes were plentiful. For the majority of folks in the Tri Cities area, however, the Gears were something of a new novelty. Saginaw, in 1972 was a place of very heavy industry and it was a time when anyone who wanted a job could get a job- or two. The factories or "shops" as they were called, ran 24/7. As a kid I recall getting up in the middle of the night and walking out into my back yard on the East Side of town. Standing there I could hear the constant "thrum" of the industry while the horizon to the north glowed an unending orangeish red from the foundries exhausts. The only thing breaking the "thrum" was an occasional train's horn echoing in the distance. Everyone was working- working all the time, first shift, second shift, third shift, time-and-a-half, double time some days and triple time on holidays- working at jobs that had always been there during my lifetime and I was sure would always be there forever. Like many of my generation, I thought that this was what it was like- everywhere. When the Gears moved into town, many local folks just did not know how to properly participate in hockey and I was among them. Being an asthmatic from birth I rarely participated in organized sports of any sort. Most sports involved a lot of running as a part of training and that simple activity always landed me back home wheezing and near death. I could skate because every winter dad would turn our back yard into an ice rink, but for the most part I was consumed by my passion for aviation and spaceflight. I couldn't tell you the difference between a football linebacker and a tailback, but I could tell you, in detail, how a Saturn V moon rocket worked. My sports world, however, was forever widened considerably on October 20, 1972. That was the evening when my dad took us all to the Civic Center where he and mom were working the hockey game. Dad and I had been going around for weeks leaving game posters at assorted retail establishments around the city as a pay-as-ya-go task that he'd picked up from the Gears. In place of some payment, he'd gotten us kids some "comp." tickets to the game. That evening the Gears were playing the Flint Generals and I went- figuring I'd be bored... hell, I'd rather have been home with my rockets. Although Canadian kids grow up with hockey, what I witnessed that Friday night at Wendler Arena was something I'd never seen before. The speed and precision of the game completely captured me... of course seeing a Flint player get clobbered with a Sherwood was pretty cool too. About all I really knew about the sport of hockey that evening was that our guys were in white and the other guys were in blue and the object of the game was to put the puck into the net. Later, all three of us kids chattered about hockey all the way home then through the weekend and then all week at school. It was the most exciting thing we'd experienced since one of my rockets set the field behind our house on fire the previous summer. On the evening of my first Gears game, the crowd was slim with most of the arena's seats being empty, but by the end of December, hockey had hooked the residents of Saginaw just as it had our family and attendance at Wendler Arena was breaking records with more than 5,000 people attending a game. Hockey did not simply "catch on" in the Tri Cities, hockey spread like a wildfire. Oddly, it did not matter one bit that the Gears had a dismal losing season in 1972-73. No matter how the TV sportscasters criticized the team, the fan base continued to grow exponentially. In our house we'd turned into hockey nuts to the point where just two months after our first game, my dad had to dish out a punishment for a combined misbehaviour of us three kids and rather than grounding us for the month of January, he simply said "No Gears games for a month!" We really felt that one too. For Christmas 1972, my list departed from the normal "Rockets, books about rockets, models of rockets" and instead included hockey skates, hockey gloves and hockey sticks." I'd finally found a sport that scrawny asthmatic like me could play. In our neighborhood we played street hockey in deep-freeze weather and skated and shot pucks on any patch of frozen water that we could find. Overnight we'd become hockey people- and we liked it. Any shred of first season playoff fantasies that the Gears or their fans may have had evaporated on Sunday, February 11th when they suffered a 1 to 0 loss at home to the Toledo Hornets and were thus mathematically eliminated from post season play. Although the sports reporters were still critical of the team, the Gears lost that game in front of nearly 4,000 fans while established teams, such as Columbus, were playing front of less than 800 paying fans. The final home game of the first season was played on March 13 in front of a near sell-out crowd of 5,503 fans. With the Flint Generals in town the game turned into a goaltender's nightmare and a goal scorer's dream. By the end of the game the Generals had more than enough goals to have won with a total of 7. Unfortunately for Flint, the Gears had a lot more with a total of 12 goals and easily won the game. There were penalties a plenty in the game because the two teams had mixed it up a month earlier in Flint and now they were both looking to even some scores. The biggest burr was between Dennis Desrosiers and Flint's Rod Cox. Cox had spent most of the previous game taunting Rosie into fighting and tried to do the same in this game, but Dennis was not taking the bait. Finally, at the urging of the crowd Don Perry sent his bruiser Mike Legge out to polish off Cox- which he easily accomplished. While Cox was in the box, Rosie skated by and tossed a rubber chicken in with him. That drew Dennis a game misconduct, but for a guy who had scored 60 goals that season- it was worth the laughs. The star of the show was the same guy who had scored the Gears very first goal- Mike Hornby. He nearly scored a double hat trick lighting up the red light 6 times. Hornby's 6th goal, however, was disallowed, but it's likely he really was not disappointed. Oddly, he was the second Gear to score 5 goals in one game- Dennis Romanesky had accomplished the same feat back on November 10th. Hornby did get a reward for his effort- from a local fan who offered to give any Gear who duplicated Romanesky's 5 goals in one game accomplishment a new car. Keep in mind that this was 1973 when a new car cost just over $3,000. The rumor was that Hornby, Dennis Desrosiers and Stu Irving conspired that if any one of them won the car, he would sell it and then the three of them would split the profits three ways. I never heard if that actually happened or if Hornby just got in the car and split town. You see he was immediately headed to Florida to join the Jacksonville Barons who were finishing their season. One would hope he kept the deal with the guys- because Hornby would be back with the Gears next season. Rosie, on the other hand, had just been signed to a North Stars contract and was reported by the Saginaw News to have "...earned a one-way ticket out of Saginaw and the IHL..." and into the AHL for the next season. No sooner had the players started to clear out their apartments and head back home than plans were being made for the 1973-74 season. Blair and Perry were content with the first season but far from satisfied. Changes would be made, but still the hockey madness had taken good root in the Tri Cities. The crowds were growing and with a slightly better record in the next season, it was thought that the franchise could go far. 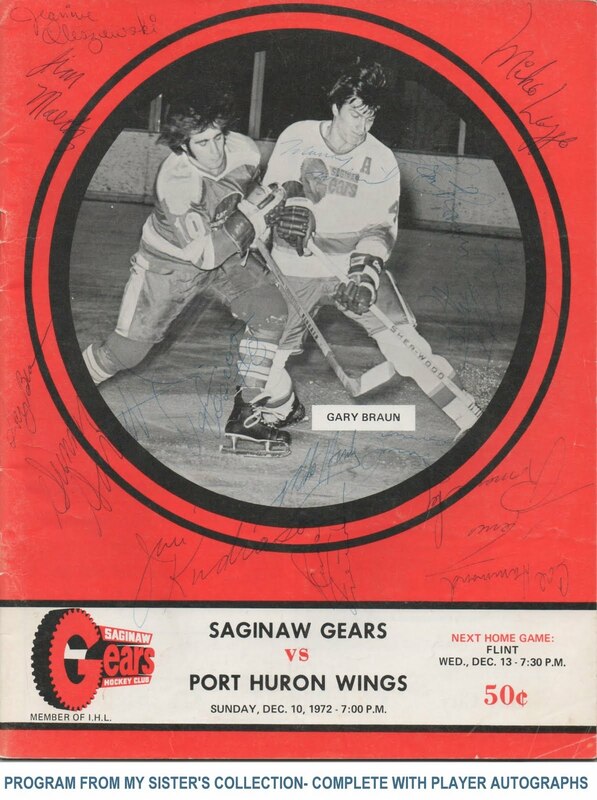 In the 72-73 season the Saginaw Gears franchise set an IHL record for highest average attendance in a first season- averaging just over 4,200 fans per game. It also had the best "wins" record in 9 years for an inaugural IHL season with more than 30 victories. Of course, Blair knew from experience that although the Gears had to get better, he did not want them to get too much better. The one kiss of death for a new franchise is to win a championship in the first or second season- because from there the only place to go is down. No doubt, Blair could not have imagined how close to that kiss of death he would come.